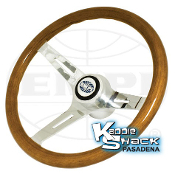 This classic 15" wood wheel design is now available again! This wheel comes with its own billet adapter to mount to your stock 1960 to 1974-1/2 bug. Comes with horn button and EMPI logo. This one has aproximately a 1-1/4" thick wood grip. 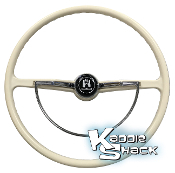 Is your original steering wheel cracked, broken, peeling, faded, etc? This is a top quality reproduction of the original style wheel. Comes complete and ready to mount! 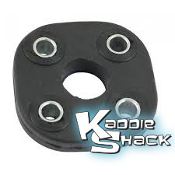 This is the seal that encapsulates the steering colum in the firewall, preventing moisture from getting into your interior, and supporting the steering colum. If your steering wheel is wandering around while you're driving, this could be one of the culprits. This is the bearing inside the steering colum that is often worn excessively, causing the steering wheel to dance around and make noises while driving. This is the bearing inside the steering colum that can fail due to mechanical or electrical issues. If you have a loose steering colum, or your horn is not working properly, this might be the culprit.